Faf du Plessis believes the World XI tour to Pakistan is bigger than the game and can help revive international cricket in the country. The South African will captain a star-studded team of players from seven countries in a three-match Twenty20 series against Pakistan in Lahore over the next four days. "It's fair to say that this will be the first time when we actually come into play cricket for something which is much bigger than the game itself," he told reporters hours after arriving amid tight security. "We look forward to what will be a great week of cricket." Pakistan hasn't hosted international cricket since terrorists attacked the Sri Lanka team bus in Lahore in 2009. The Pakistan Cricket Board tried to win back the confidence of foreign countries over security concerns, but only Zimbabwe visited the city two years ago for a short limited-overs series. The successful Pakistan Super League final in March helped showcase the country's ability to host international matches, with foreign players such as the West Indies' Darren Sammy and Marlon Samuels competing. Working closely with the International Cricket Council's Pakistan Task Force team headed by Englishman Giles Clarke, the PCB managed to draw international players and prove once again it's safe to play matches in the country. Former Zimbabwe captain Andy Flower is the coach of the World XI and convinced players from South Africa, New Zealand, England, Sri Lanka, Bangaldesh, West Indies and Australia to tour Pakistan. The ICC has sent security experts to monitor the three T20s at the Gaddafi Stadium, while at least 500 meters of the main road leading to a five-star hotel where teams are staying is completely cordoned off. 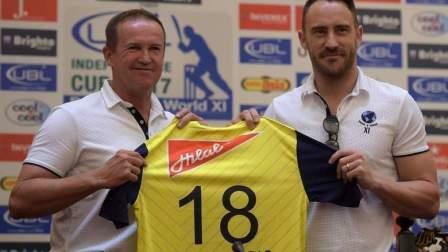 Du Plessis said security was obviously the players' main concern before agreeing to take part. "When this whole thing came about, you do think about that (security) sort of things," he said. "But as soon as we spoke to the people who were in control of the security, the planning ... as a player all you want was that peace of mind and they gave it to us. "They are very confident that this will be smooth sailing. We just wanted to get here and experience what was going to be something that was going to be huge turnaround in world cricket." Flower took feedback from his younger brother Grant, who has been the Pakistan team's batting coach the past three years. "Obviously I spoke with him after Giles Clarke had first approached this idea with me," he said. "I was quite comfortable with the feedback that he was giving me and therefore, I was quite comfortable talking to the international players and encouraging them to take part in this venture." Clarke said the PSL final in March helped the PCB's cause to organise the World XI series. "I think if the PSL final had not been played here, I don't know how easy this would have been," he said. "Everybody had the courage and the confidence to play here and that was an absolutely essential for this series." PCB chairman Najam Sethi said he had support of the ICC in organising the series and hoped it will pave the way for next month's Twenty20 international against Sri Lanka and with a planned three-match T20 series against the West Indies. "We know this is a small step in many ways but a huge leap for Pakistan," he said. "We now expect more doors to open."